Scott's Seafood has been a consistent staple in San Jose's fine dining scene for years. Now, they are working on a revitalization to take the restaurant to the next level. A few years ago they built the most impressive publicly accessible outdoor patio Downtown, which is perched 6 stories high with a view of Plaza de Cesar Chavez. 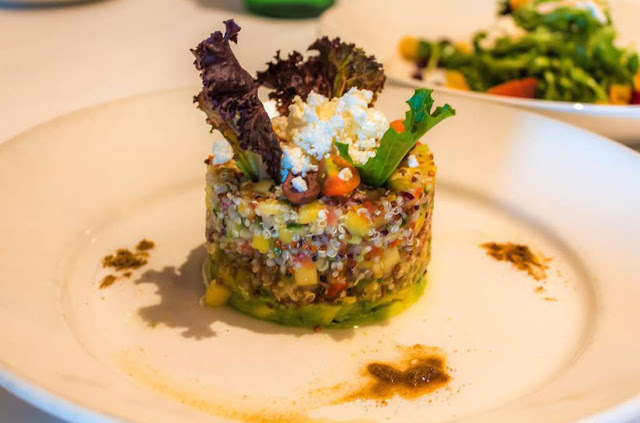 A few months ago they brought in a rockstar chef, Khaled Ghazal, who is bringing a modern take on classic dishes. 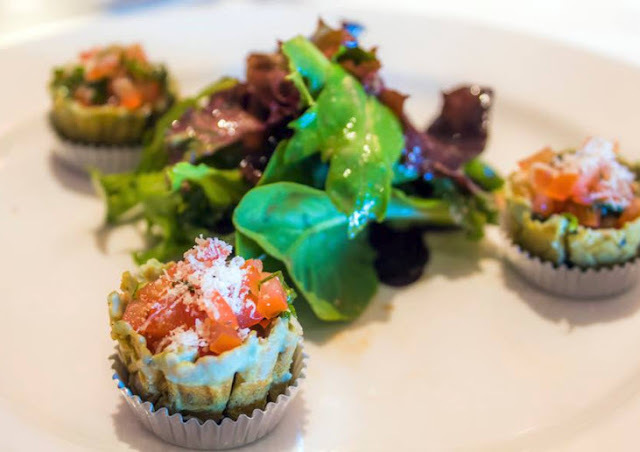 John Huân Vũ, Andrew Rivlin, Noe Sacoco, and I were invited to try the new lunch menu at Scott's Seafood. Collectively, we were blown away. I have been to Scott's many times, and this was by far my best experience. Before we got into lunch, we were lucky to sample two items from the catering menu. 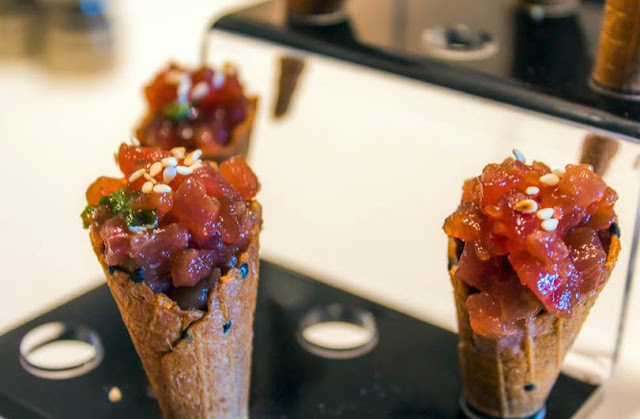 An ahi poke in a soy sauce infused waffle cone and bruschetta in a basil infused waffle. Both were delicious with outstanding presentation. These are several of the many options available for private events. 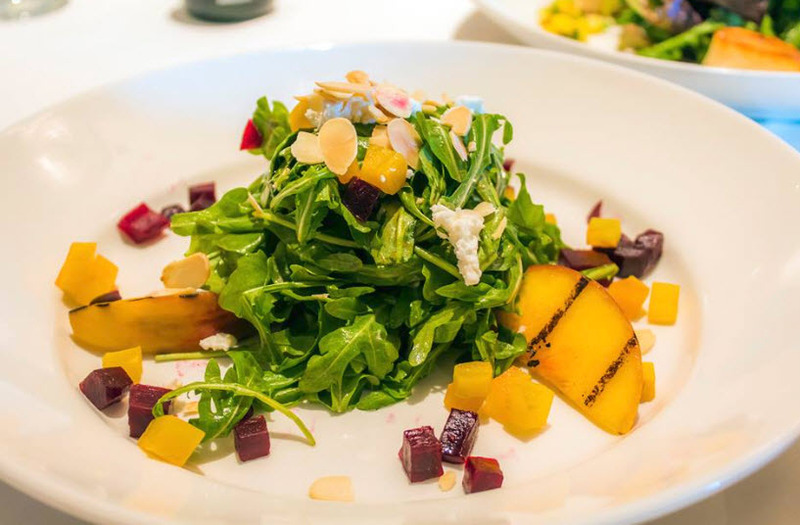 The first lunch dishes we sampled were three salads: the seared scallop salad with organic mix greens, rainbow quinoa salad, and red & golden beets salad with grilled peaches. Each of us had a favorite. 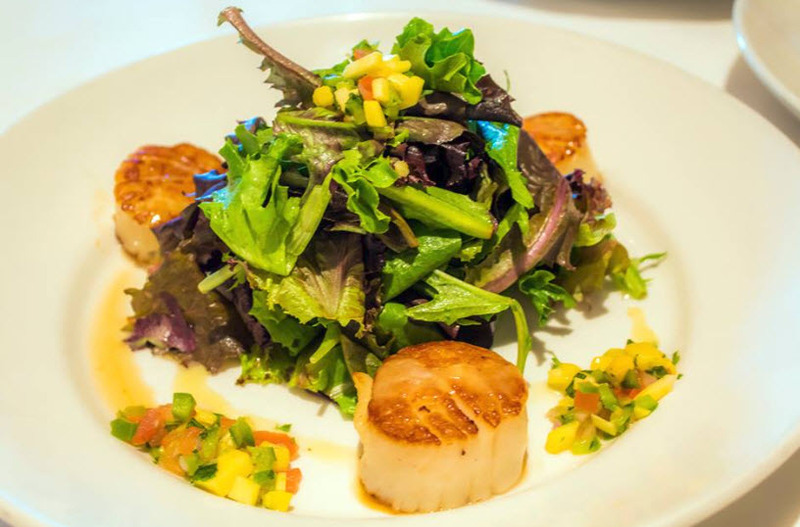 I have always loved the way Scott's Seafood does scallops, so that one was my personal fave. The pomegranate molasses vinaigrette on the red & golden beets salad impressed everyone at the table. Round two featured a Burrata with arugula and cherry tomatoes that was the best I have ever had in the South Bay. John said he only had better in Italy. 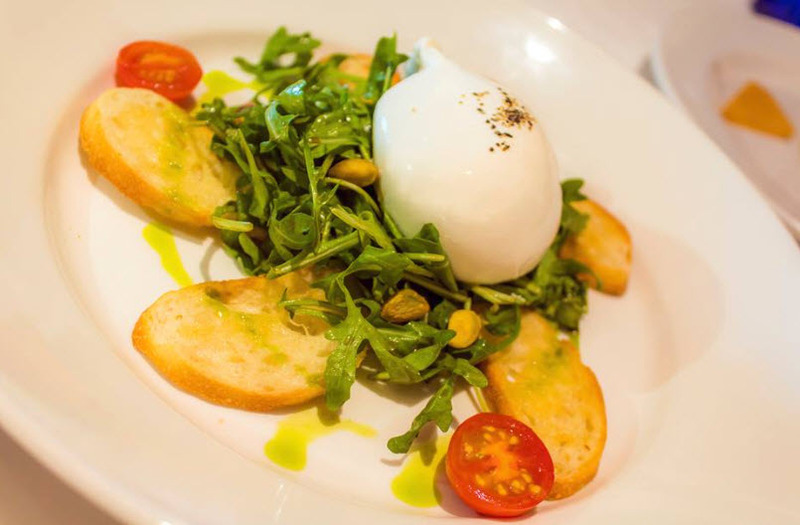 If you like cheese even a little bit, this is a must-order dish. 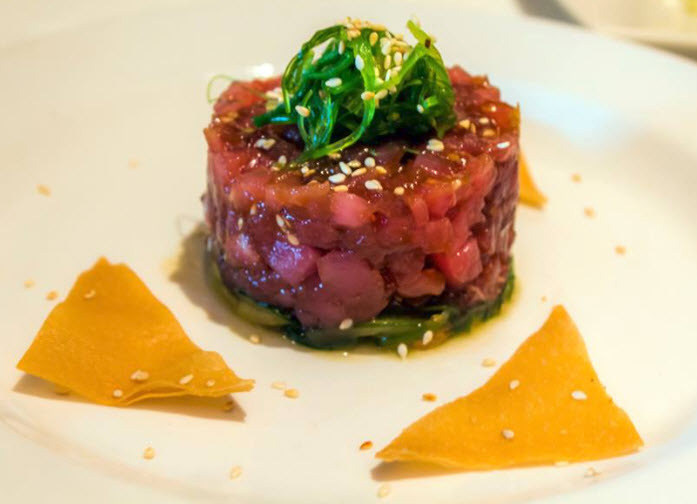 We also tried a tuna poke with seaweed, cucumber, and wontons that was a more elaborate version of tuna cone we had earlier. However, the real star of this round was the squid ink croquette with calamari. 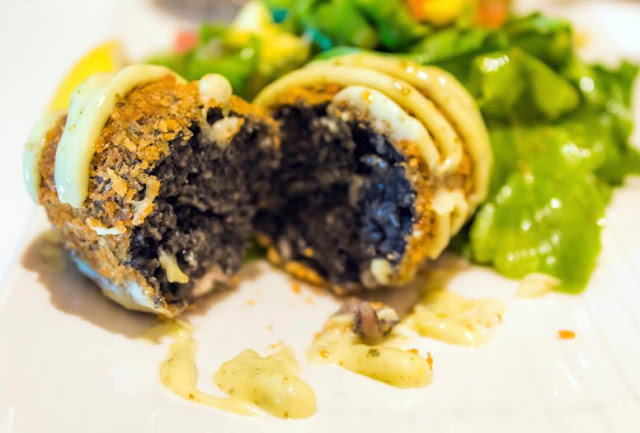 The squid ink added a complex and briny flavor that went flawlessly with the croquette and added a dramatic color to the dish. It sounds a bit exotic but this is an appetizer that is likely to please anyone who likes calamari or crunchy fried foods (nearly everyone). The croquette was one of the more creative plates and was John's favorite dish. Last but definitely not least, we got to try four signature lunch entrees. The Scott's Kobe Burger has to be a contender for the best burger Downtown. It features Snake River Ranch kobe beef, onion jam, duck bacon (! ), arugula, pepper jack, and a truffle aioli. 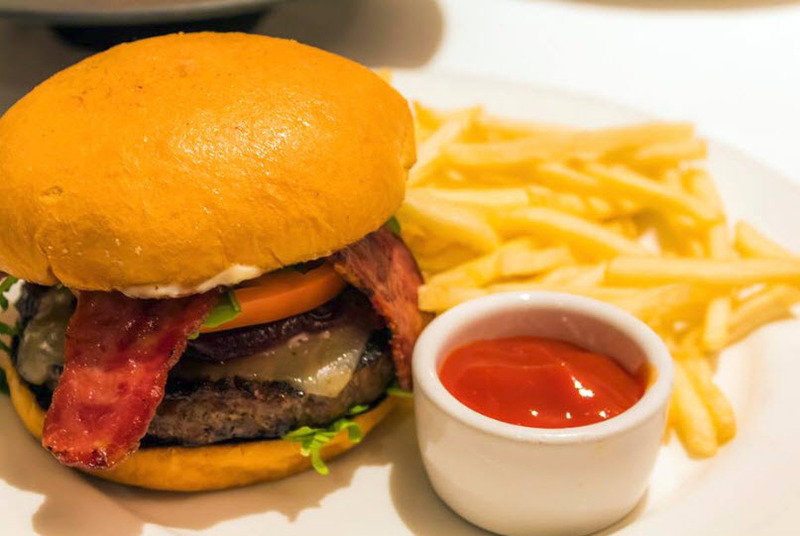 It's about as decadent as a burger can get, especially with the duck bacon and truffle aioli. 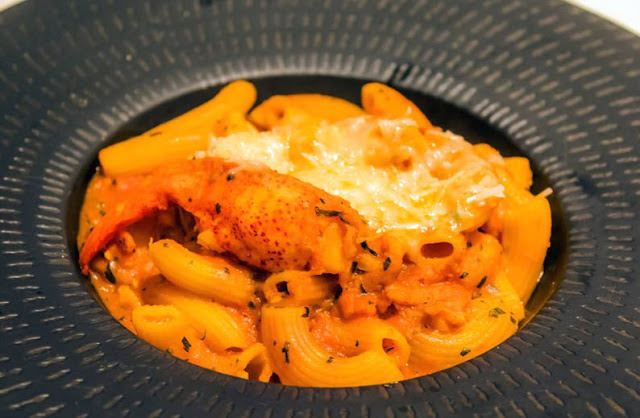 The lobster rigatoni was a combination of fresh rigatoni pasta, cherry tomatoes, Gruyere cheese, tarragon, bisque sauce and generous pieces of lobster. 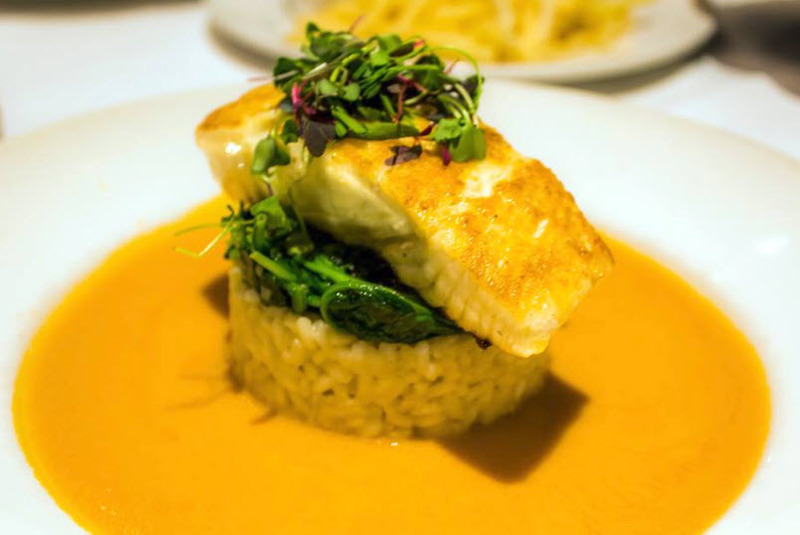 The halibut bouillabaisse lemon risotto was a more modern take on a Scott's classic with beautiful presentation. 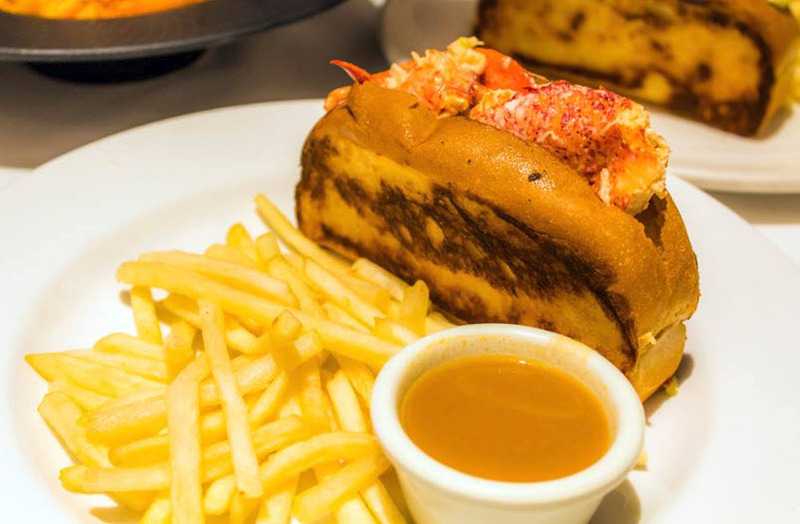 Finally, our favorite was the lobster roll. It's pretty hard to find a great lobster roll in San Jose, this is it. The crispy and buttery bread with well-seasoned chunks of lobster smothered in shellfish bisque sauce--flawless. Beats Sam's Chowder House any day of the week. If you have never been to Scott's or haven't been there in a while, we highly recommend trying the new items on the menu. Don't forget to check out the amazing patio while you're there. Big thanks to John Huân Vũ for taking all of the photos. 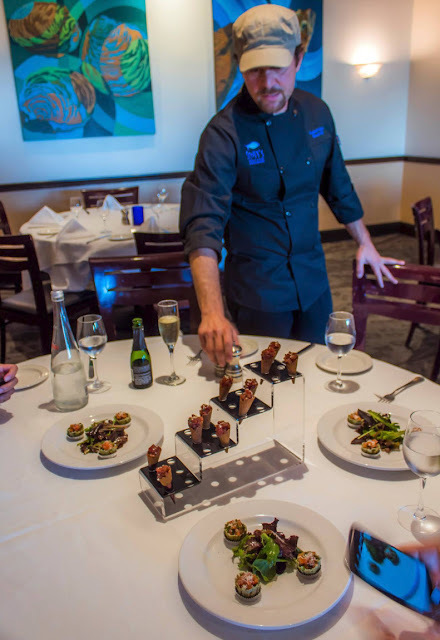 For more info, menus, and reservations, head to the Scott's Seafood website over here.